after turning on the machine dopus runs fine and opens on double click the desktop. take to day, after using it for may be 20 mins I closed the open lister and went for lunch, returning around an hour later dopus will not open a lister either by double clicking on the desktop, by using the start menu icon and nothing happens when I either right or left click on the quick launch icon. task manager shows both dopus and the dopus helper running. the only way of getting dopus back is to restart my computer. We should have a fix soon, and a new test version sooner if you'd like to try it. They'll be posted in that thread. yes please, I'll keep my eye open. dopus: UpdateString would have previously invalided PIDL for "O:\"   dopus: UpdateString would have previously invalided PIDL for "P:\"
Does 12.12.1 work OK for you, and the problem only start in 12.12.2? Was the new test version working OK at first and only stopped after running Anno 1880? Could you describe how it goes wrong so we can be sure it's the same issue? this time I started at system boot, killed dopus ran debug and used the .exe dopus ran as it should with no sightings in debug. I just left the computer alone at 1.22pm and did other stuff all day, came back to the computer at 8.50pm. Same as before happened, there's nothing showing in debug about dopus but I cannot use it. 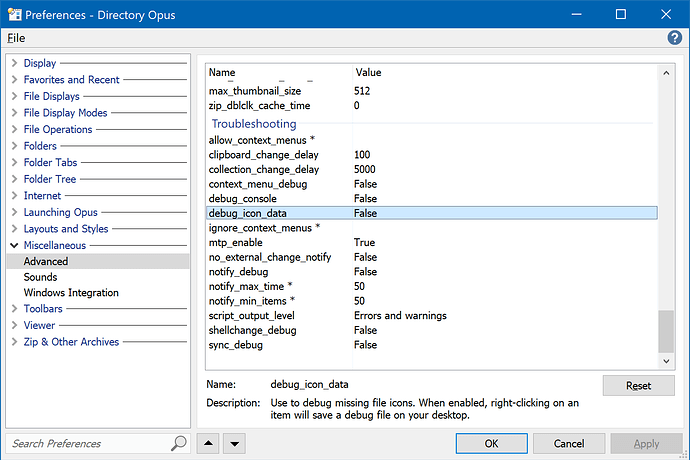 According to task manager directory opus and directory opus helper application are running but I cannot get dopus to show its self. I have tried opening dopus by using the start menu icon, double clicking on the desktop, double clicking the icon in the quick start menu, single click the quick launch icon and selecting open new lister but nothing happens and right click the desktop and select new lister. The strange thing is I have it on another machine and it works as expected and not showing any problems like this one. That one is using v12.12.4 beta I've not updated that one yet. So you're not even seeing the UpdateString would have... lines that you got before, while still using the test version? 00000001	0.00000000	  dopus: UpdateString would have previously invalided PIDL for "O:\"
00000002	0.00432380	  dopus: UpdateString would have previously invalided PIDL for "P:\"
I've just had a different one ? after clicking ok it saved it as win10-64bit-radeon-software-adrenalin-2019-edition-19.4.1-apr3.exe.txt on my desktop. There is only one extra line in debug and I had that before I ran dopus. 00000002	0.00405790	  dopus: UpdateString would have previously invalided PIDL for "P:\"
not much use for this problem I know. That should only be on if you're trying to diagnose issues with incorrect or blank icons in context menus. Could you try a creating a manually generated process dump when things are going wrong? That will help us see if it's the same type of problem as in the other thread, or something else, and may help us solve what's going wrong. Line 1: 00000001	0.00000000	  dopus: UpdateString would have previously invalided PIDL for "O:\"
Line 2: 00000002	0.00377260	  dopus: UpdateString would have previously invalided PIDL for "P:\"
Line 744: 00000744	356.88552856	  dopus: UpdateString would have previously invalided PIDL for "O:\"
Line 745: 00000745	356.88989258	  dopus: UpdateString would have previously invalided PIDL for "P:\"
Line 761: 00000761	374.60687256	  dopus: UpdateString would have previously invalided PIDL for "O:\"
Line 762: 00000762	374.61035156	  dopus: UpdateString would have previously invalided PIDL for "P:\"
Line 2818: 00002818	3750.45654297	  dopus: UpdateString would have previously invalided PIDL for "O:\"
Line 2819: 00002819	3750.46069336	  dopus: UpdateString would have previously invalided PIDL for "P:\"
now it wont open any listers again. I just left it alone for a couple of hours. Is there something.on your system that would be frequently renaming disks or changing their icons? Or are those removable drives or network drives which are changing state? Please make the dump file I mentioned earlier. That could point to where the problem is without having to guess. That looks like it's part of a screen recording tool. Try uninstalling that and see if the problem goes away. If it does, it was most likely the cause and you'll probably need to contact the authors of it. If you still have the problem with it uninstalled, please send any new dumps and we can analyze them. the latest playclaw6 update I have is dated the 9th april, I'm trying work out which version it is crashing it. Yes, that was the same component. thanks for the confirmation, I've emailed them with their logs to see if they can fix it. Just add its process in the playclaw black list. changed it as advised in playclaw6 settings. It'd be good if they actually fixed it rather than make people manually add processes they crash to a blacklist after spending a week working out what the cause is. But we have no control over what they do, other than potentially showing a warning if we detect their DLL in our process.